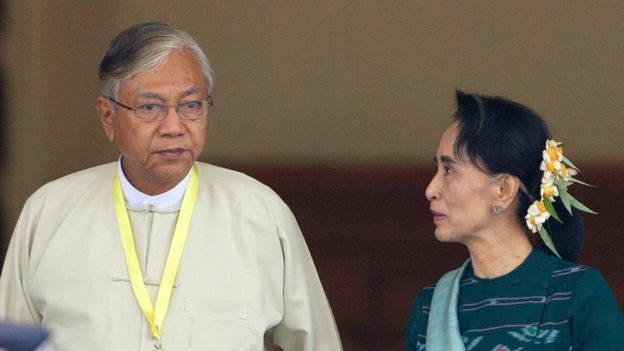 Myanmar’s Parliament has elected Htin Kyaw (69), a close ally of Aung Sang Suu Kyi, as the first civilian President of the country after 53 years of military rule. He was candidate of National League for Democracy (NLD) party and was elected after securing 360 of the total 652 casted votes. Aung Sang Suu Kyi, who became victorious in the last national elections,cannot hold Presidency as the constitution bars anyone with children who are citizens of another country from holding the post. Her sons are British citizens. Htin Kyaw Htin Kyaw is a close aide and adviser of Nobel Peace laureate Aung San Suu Kyi who is the leader of NLD party that has majority in the parliament. He will replace Thein Sein as President who will step down at the end of March 2016 i.e. after end of five years of army-backed rule. He was born on 20 July 1946 and his father was a legendary writer and early member of the NLD.